Teal'c visits Atlantis to counsel a headstrong Ronon, who is up for review by the I.O.A. But the two must work together when the Wraith invade the Midway space station in order to reach Earth. Of course it is Midway Station’s lack of safeguards on the Stargates themselves that allowed the Wraith to penetrate the station. Rodney believed his closed-network system of Stargates to be unhackable, and this hubris prevented Earth from the sort of security redundancy that could have avoided this incident. The Milky Way gate on board Midway had been locked out with a security code, which must be input into the station’s dialing computer in order to allow the gate to be dialed at all. This code is evidently different than the iris code, which is transmitted by radio to notify Stargate Command to open the iris guarding Earth’s Stargate. MSgt. Walter Harriman does report receiving a dedicated I.D.C. (iris deactivation code) from Midway, prompting him to open the iris for the Wraith. This suggests that the iris code is built in to the Gate Bridge systems, or automatically transmitted by the Midway computer after the security code has been entered and the Milky Way gate dialed. Just how is the iris code transmission relayed to Earth? For a direct connection between two Stargates it would be simple enough: radio waves travel through the open wormhole just like matter (and, unlike matter, can even be transmitted in both directions). But the gate bridge uses dozens of Stargates to relay transiting matter, one connection at a time, so that only two proximate gates are open at any given time. When Earth’s Stargate activates at the end of the chain, Midway’s gate has been inactive for several minutes. How, then, can the S.G.C. receive an iris code via radio transmission? If it is the case that Stargates do not hold and re-transmit radio signals like they do matter, the second possibility is that scientists modified the Stargates in the bridge to outfit them with radio transmitters. This would allow simple Earth technology to receive the radio signal and, once the next gate has been dialed, automatically re-transmit it through the wormhole. The most likely scenario would be that Earth scientists improvised a power source (such as a small naquadah generator) and attached it to each Milky Way gate when they were deployed into the void between galaxies. It is also conceivable that a Stargate can store a small charge from the wormhole once it is dialed, giving it enough power to dial out once (much like the S.G.C. gate retained enough power for a single dial-out after being disconnected from its power source in “Nemesis”) — though there is no evidence elsewhere in canon that Stargates behave this way. “Christopher Judge showed up this year, which was fantastic. And it was actually — it made a lot of sense. 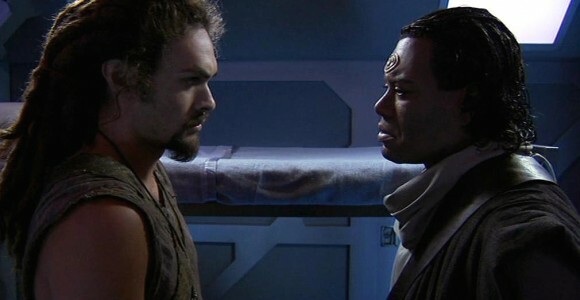 Most of the episode he does is with Ronon, and as the resident expert on being the new alien on board, Teal’c has a lot of information he can pass on to Ronon, a lot of expertise. VOTE! How would you rate Atlantis's "Midway?"